Prime Minister Ahmet Davutoğlu said Tuesday that "terror is not just a problem for the government but a problem for Turkey and the opposition must act in a certain manner in sharing this burden." Speaking at the Justice and Development Party (AK Party) parliamentary group meeting, the prime minister said Turkey is a country that has fought terror for 40 years and called on the opposition to be transparent in their attitude against terror. "Counter-terrorism is not only a problem for the government, but it is a problem for Turkey. There are very important duties not just for the ruling party but also for the opposition. The most important among those is to have a transparent attitude on terror." 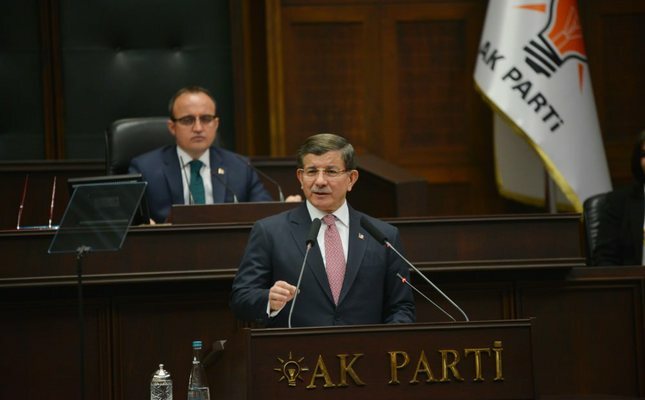 Davutoğlu criticized the main opposition Republican People's Party (CHP) Chairman Kemal Kılıçdaroğlu's remarks that targeted the government and his party, saying that "Kılıçdaroğlu has a very typical and predictable attitude towards terror attacks. We have yet to get a clear picture from him regarding his attitude towards the terror issue. What we hear in the wake of terror attacks is just baseless, AK Party criticism." He said the CHP, along with the pro-Kurdish Peoples' Democratic Party (HDP), serve the aims of terrorists with the statements they make. Davutoğlu also claimed the CHP's statements have only caused people to panic instead of evoking confident, inspiring words. He also indicated that the CHP goes hand-in-hand with the Gülen Movement whenever an operation is launched against the movement. The prime minister also thanked the Nationalist Movement Party (MHP) Chairman Devlet Bahçeli for his support against terrorism. "They [the MHP] have set a good example for what kind of an attitude must be adopted during such times. I took a break during the Cabinet meeting and they said, 'We have come to declare our support. You should not further postpone the meeting, our support is with you.' This is the what we want to see from the opposition." He also said that terrorists should never be met with an atmosphere of support that creates the illusion of legitimacy. "Some sensibility emerges from the international media when a terror attack takes place in Belgium or France but our government receives more accusations than the terrorists who have attacked Turkey." Davutoğlu also condemned Tuesday's terror attacks in Brussels which left 20 people killed and 55 people were injured, 10 of whom remain in critical condition. "I curse the attacks that took place this morning in Brussels, once again showing the global face of terrorism; I express my sincerest condolences to the Belgian government and the people, and wish to convey feelings of solidarity on behalf of our nation," Davutoğlu said. "I invite all of humanity to act in solidarity against global terror and all kinds of terror," he added. European Union Minister Volkan Bozkır has said that a "total fight against terror" is necessary in the wake of the attacks that targeted the airport and subway in Brussels, where most EU institutions are located. Speaking in a live interview on A Haber, Bozkır said that the attacks may have been carried out by the DAESH terrorist organization in retaliation for following the recent operations that targeted DAESH-linked figures in Brussels, including the Paris attacks perpetrator Salah Abdeslam. "We offer our condolences to the deceased and wish a quick recovery to the wounded," he said. Underlining that the militants constitute the core of the DAESH terror organization, Bozkır said that if Turkey's accession process was not slowed down, neither terror nor illegal migration would have increased to such dimensions, and now the EU understands this fact. Stating that all terror organizations feed from the same sources, Bozkır said that now it is time for every country to adopt a common stance against terrorism. Bozkır said, "Turkey has long warned the EU regarding the economic crisis, the refugee issue and terror. Instead, the EU fought terror organizations that may harm itself, but overlooked other terror groups. "When [Revolutionary People's Liberation Party–Front] the DHKP-C's leader was out in the open in Belgium for years, no precautions were taken despite our warnings," Bozkır said, explaining there is no difference between the PKK, DAESH or the DHKP-C. "The waving of PKK flags in Brussels when tens of funerals were being held in Turkey following a terror attack upset us, but this struggle really has to be carried out totally. Brussels is a multicultural city. And it proves once again that international solidarity is essential," he added.